Hi Bruce, Yes we finally got her ready for sea. We took her out last Saturday. In about 7-9 knot winds, we were making 3.7 to 4 knots close hauled and 4.5 knots running downwind wing and wing. What really made me happy was that once the sails were trimmed to her course, she steered herself, keeping within 5 degrees of a base course. I sat there for 15 minutes and never had to touch the wheel. 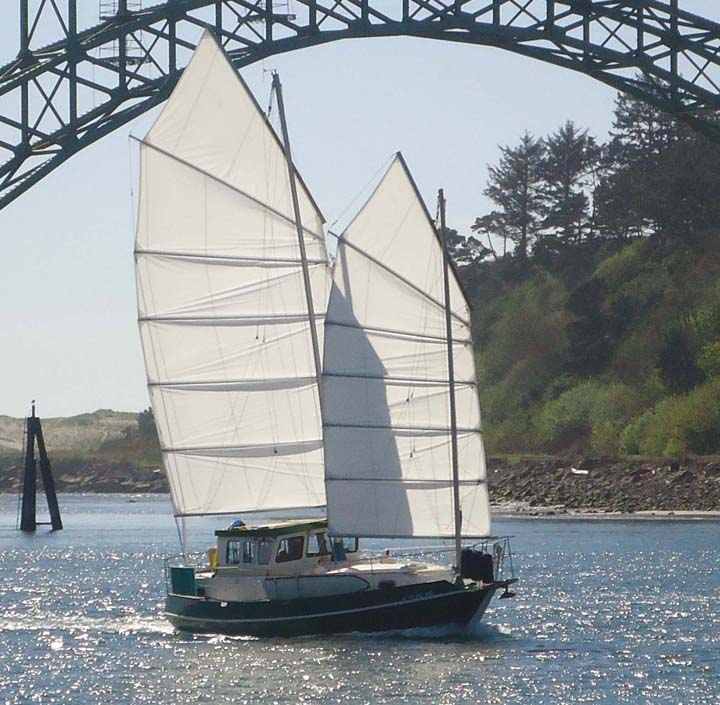 We are looking forward to heading north from Newport, ORE.& up to the Anacortes WA. area early next month. Regards Rod and Dee Palanca ... "Icanaho." Delivered by DOWNLOAD to your computer, the study plans have lists of materials & equipment etc & these will be useful in costing out the complete boat. Each STUDY PLAN contains ALL the construction drawings for each material - STEEL, ALUMINUM & WOOD EPOXY as applicable to the particular boat plan - with up to 25 sheets per plan! Lists of materials - Technical information - Numerous construction drawings are all included. L.O.D. 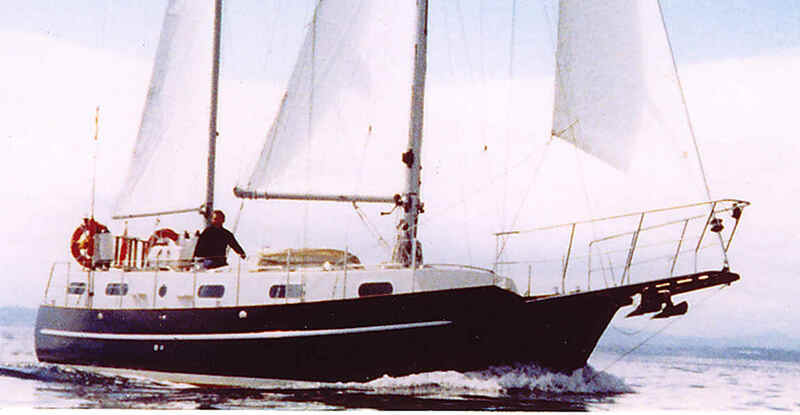 ( HULL) 11.05 m 36' 4"
L.W.L. 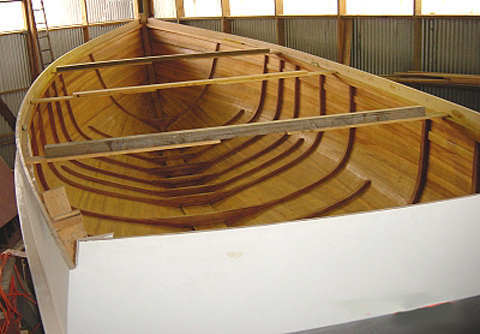 9.85 m 32' 4"
DRAFT 1.30 m 4' 3"
Gaff Schooner shown above is part of the standard boat plans. 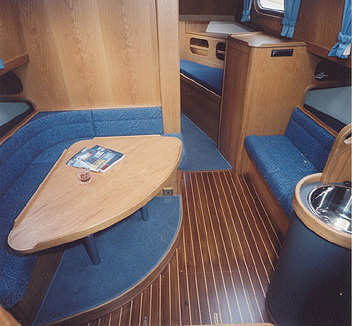 Several other rigs can be used on this boat; see study boat plans for more details. Here are some comments from a broker in South Africa who sold a Centennial Spray that was built in Vietnam. Alternate Pilot house shown - Junk rig is also included with boat plans & study boat plans. 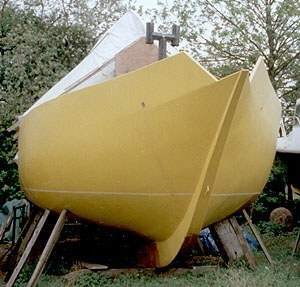 BOAT PLANS & Full Size Patterns are available for the CS 36 to be built in Round bilge Steel or Aluminum of Wood/Epoxy. 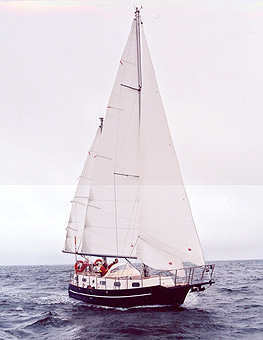 Several alternate sail boat plans are possible and any sail plan offered for the regular Spray 36 can be used on this boat. Center cockpit, Aft cockpit and Pilot house versions are possible. UPDATE - Recently I saw this boat and it is now in the water and spoke with the owner who is delighted with the sailing performance and general handling of his Centennial Spray 36. This Centennial Spray 34 can be fitted out the same way as we show for the Centennial Spray 36 -Note attractive interior - this is truly a beautiful boat the the owner is most pleased with the performance. There are many photos of step by step wood epoxy and steel construction shown on the study boat plans on DOWNLOAD or on USB and of course this information is included in the plan package as well.